This review originally appeared on rpg-resource.org.uk in Jan. 2018, and was reprinted in the July/August 2018 issue. 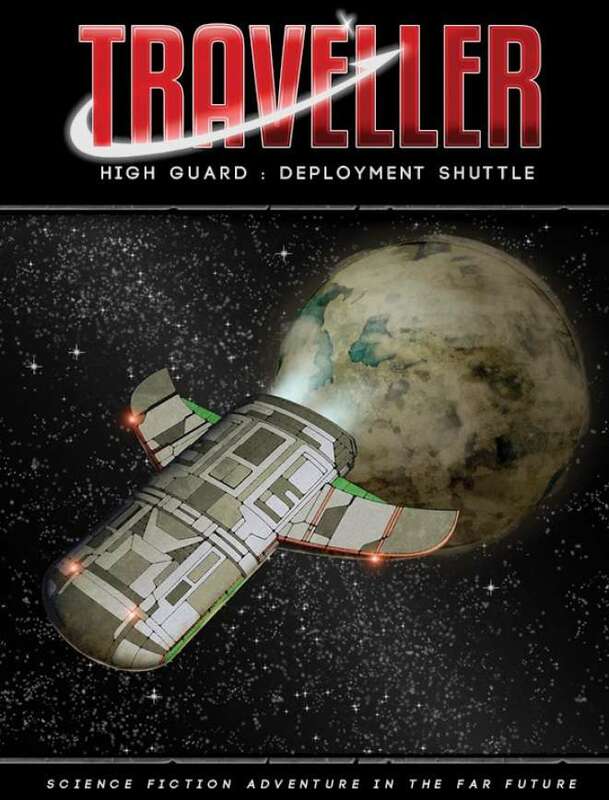 High Guard: Deployment Shuttle. Martin J. Dougherty. This short work not only introduces and specifies a useful (if specialised) space vehicle, the deployment shuttle, but also explores some of the uses to which it might be put in times of peace and of war. Several variants of the standard build are discussed, and the operations of Marine Assault Forces, which often use them, examined. Quite a lot packed in… and there’s more! Several ideas for their use in your campaign, whether the party is riding in one or it is advancing on their vessel, are also included. The deployment shuttle is optimised to get people where they need to be, on the ground or in space. As such it is very fast-moving, and capable of operating in atmosphere as well as in vacuum. It requires a crew of two, as well as whoever is being transported (up to 36 individuals), and can operate for up to four weeks although as there are only basic facilities aboard this is not recommended. Most missions are but hours long. There’s a detailed description, full statistics, and a plan of the standard craft. Next comes a discussion of typical operations carried out using a deployment shuttle. Whilst it can be used for standard personnel transfer on orbit or from ground to space, its main function is to deliver troops in combat situations. This can be an opposed landing groundside or a boarding action in space. They are also popular for spaceside activities such as customs or other inspections of ships arriving in system—they can force entry if it is not granted, and can cope with such as environmental contamination. Various tactics are discussed in considerable detail for the ground landing options, useful if you are planning mercenary operations or indeed if the party serves in regular military forces. The following chapter discusses Marine Assault Forces. A deployment shuttle is large enough to contain a standard Marine platoon (35 people), plus an additional specialist or other individual felt necessary for the operation at hand. Standard armament and operating protocols for the Marines are covered—including plenty about that iconic weapon, the cutlass—and then we move on to the next chapter which covers Boarding Actions and Inspections, the other in-space role of a deployment shuttle. Next comes some common variants of the standard deployment shuttle with notes on their uses. These include medical variants, reconnaissance, fighter control and space rescue craft (these last being illustrated painted in colours corresponding to vehicles used on the TV show Thunderbirds!). They can also be used for holding or transporting (or even executing) prisoners, surveying and patrol work. Finally, there are some missions. One involves a hazardous survey job, another sends the party to investigate why a colony has gone ‘dark’, and the third is a ‘decapitation strike’—a raid that takes out the enemy leadership directly. All will need work before you can run them, but plenty of interesting background is provided. This is a useful vessel to have in your universe, one that the party is likely to encounter at some time even if they never ride in one.